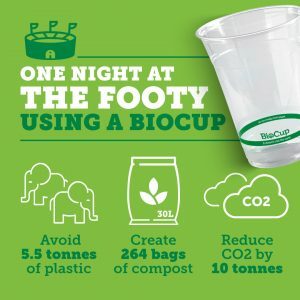 Tuesday night’s War on Waste episode broadcast by the ABC featured BioPak compostable bioplastic BioCups as a solution Kiama High School canteen are implementing to divert waste from landfill, and avoiding the use of conventional plastic. What if more institutions switched from conventional plastic cups to compostable bioplastic cups? Today, 95% of plastic packaging material value, or $80 billion to $120 billion annually, is lost to the economy after a short first use. An overwhelming 72% of plastic packaging is not recovered at all: 40% is landfilled, and 32% leaks out of the collection system—that is, either it is not collected at all, or it is collected but then illegally dumped or mismanaged. Without significant action, there may be more plastic than fish in the ocean, by weight, by 2050. Even by 2025, the ratio of plastic to fish in the ocean is expected to be one to three, with plastic in the ocean forecast to grow to 250 million tonnes. In this week’s episode, Reucassel investigated organics waste collection as a viable solution for diverting waste from landfill, reducing methane gas emissions, recovering resources to generate economic value, and creating jobs. Composting is essential to winning the war on waste – and it isn’t just good for the environment it’s good for the economy, too. The episode highlighted Kiama High School’s efforts to reduce waste by introducing BioPak compostable packaging as a more sustainable option for single-use disposables in the school canteen. Reucassel shows a BioCup (plant-based bioplastic cup) which can be thrown in the compost with other food scraps and organic waste. We believe compostable foodservice packaging is part of the solution. But not all councils offer commercial composting so, we launched the BioPak Compost Service – to ensure our cups and takeaway packaging, along with food scraps and organic waste, are diverted from landfill to commercial composting facilities. The service is available in 9 major cities in Australia and New Zealand and diverted 90 tonnes of waste from landfill in six months. Creating 63 tonnes of compost, that’s 4,316 x 30 litre bags of compost. It also prevents 167 tonnes of carbon emissions from being created. That’s equivalent to the emissions generated from driving a car around the world 17 times! War On Waste has always encouraged Australians to be conscious of their consumption habits and take matters into their own hands, rather than rely on governments to clean up our act. 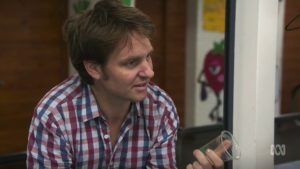 In a recent War On Waste Q and A episode, Host Craig Recaussel said ‘I think it’s a bit hypocritical to kind of go, “Government, you sort it out. I won’t change until you do it”’. While public policymakers are still trying to assess what’s wrong with recycling programs, large corporations and small entrepreneurs alike are in the best position to take the lead. The BioPak Compost Service is an example of taking matters into our own hands and proving the model can scale. In the first six months since launch, the service has been rolled out across 1,300 suburbs in 9 major cities in Australia and New Zealand and diverted 90 tonnes of waste from landfill in six months. So what are the benefits of composting, exactly? 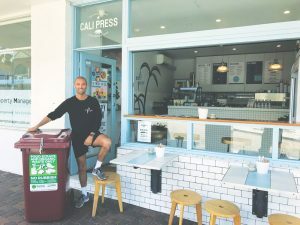 Cali Press cafe and their food scraps and organic waste bin. Image supplied by BioPak. Born in South Africa, Richard is a second generation packaging professional and worked in the family plastic packaging business for 15 years before immigrating to Australia in 2003. Richard established BioPak in 2006, BioPak is the leading supplier of plant-based single-use food service disposable packaging in Australia and New Zealand. In the span of a decade, BioPak has disrupted an industry and helped numerous business reduce the environmental impact of their operations. Gary started BioPak with business partner Richard Fine in 2006. At the time, interest in sustainably sourced, compostable foodservice packaging was very low. In the span of a decade BioPak has since disrupted an industry and helped numerous businesses reduce the environmental impact of their operations. BioPak is now the leading supplier of plant-based single-use foodservice disposable packaging in Australia and New Zealand.